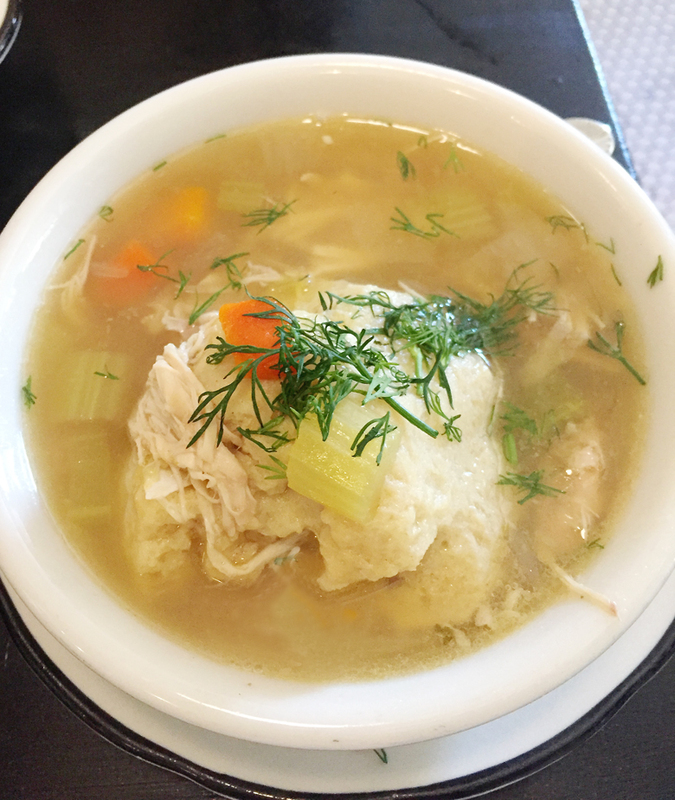 Comfort in a bowl — matzo ball soup at Grand Lake Kitchen. 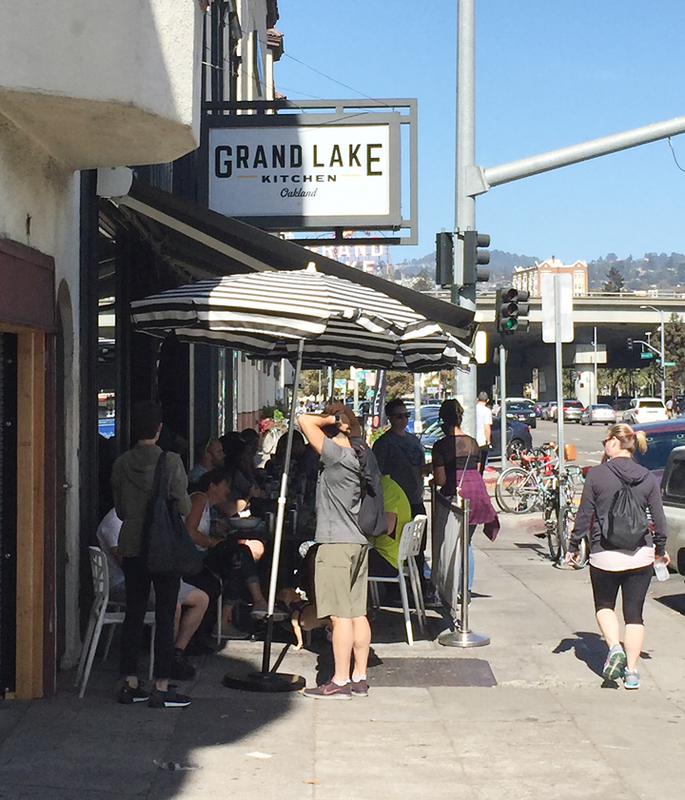 If you’re walking up to Grand Lake Kitchen in Oakland for the first time, it’s easy to spot yards before you get there. Just look for the line. Especially for brunch on weekends, there is always one. But just put your name in, give your cell phone number, and you can mosey around nearby Lake Merritt until you get a text that your table is ready. That’s what my husband and I did one recent Sunday, paying our tab for the meal at the end. Because our wait was about 20 minutes for a table in the early afternoon, we just missed enjoying the brunch menu by about 5 minutes. Drat, because there are some especially intriguing items on it that I was hoping to try, including the Savory French Toast ($14) made with rye bread that’s dipped in porcini batter. How good does that sound, right? A line almost always means that a place has got to be good. Instead, we contented ourselves with the afternoon menu, that’s served from 3 p.m. to 5 p.m. This charming establishment is tiny. It’s hard to imagine that when it first opened, it was half its present size, especially because it tries to make everything that it can in-house. But in 2016, four years after opening, it got the opportunity to expand into the space next door to add a little more wiggle room. Husband and wife, Chef Dave Wasem and May Seto Wasem are the owners. Dave is former sous chef of the Balboa Cafe in San Francisco, where May was also working front of the house. And yes, that is how they met. It’s easy to love this place. It feels not only of the neighborhood but adored by locals. Hence, the long lines. There’s a long bar stocked high with shelves of liquor and plenty of seats down its length. Water is served in stainless steel tumblers that keep it nice and cold on a warm day. 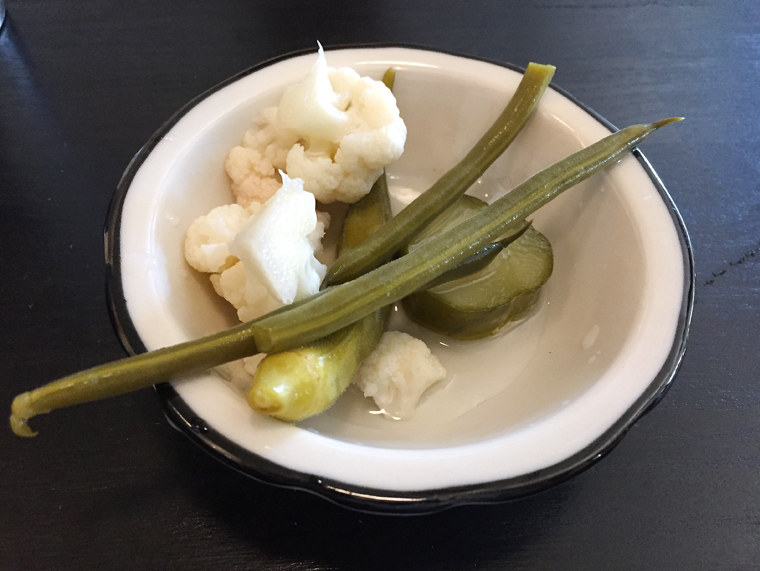 You can get a little gratis bowl of house-made pickled veggies to nibble on as you peruse the menu, too. I knew I had to get the Matzo Ball Soup ($8). Grand Lake Kitchen is known far and wide for it. Plus, the recipe is going to be in my new cookbook, “East Bay Cooks” (Figure 1), which will debut in summer 2019. It did not disappoint. It is soothing, like a hug in a bowl. The chicken broth is delicate, and the carrots and celery still have integrity, rather than having been cooked to oblivion. The matzo ball is the size of a baseball, and so fluffy and wonderful. A little fresh dill over the top of the soup adds a nice spark of fresh herbaceousness. A little bit of this, a little bit of that, and a whole lot of good. 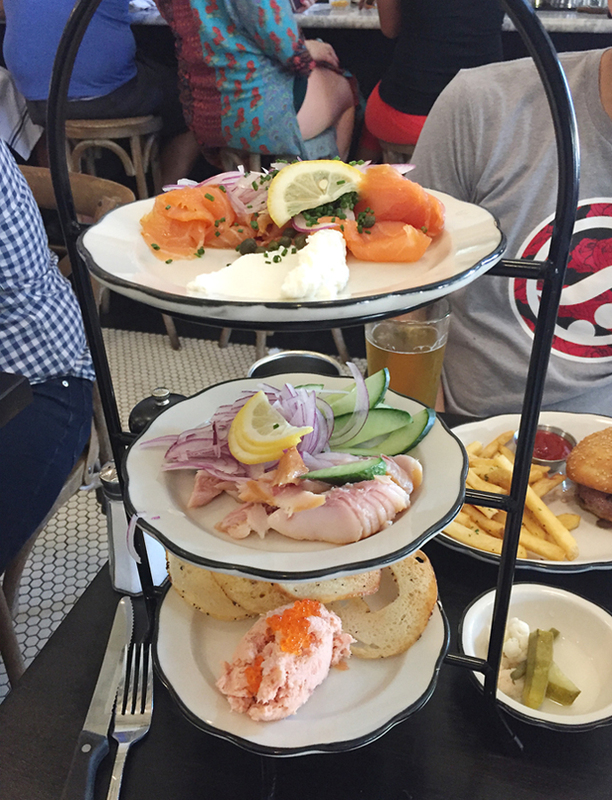 After that, it was on to the Smoked Fish Tower ($25), which arrives on a tiered stand, the kind you might get at high tea. Arranged on three different levels were trout dip, smoked salmon, smoked sturgeon, cream cheese, capers, thinly sliced red onion, cucumbers and bagel chips (which your server will gladly replenish if you need more). It’s the next best thing to being at Russ & Daughters in New York. My husband, aka Meat Boy, couldn’t pass up the GLK Burger ($14). 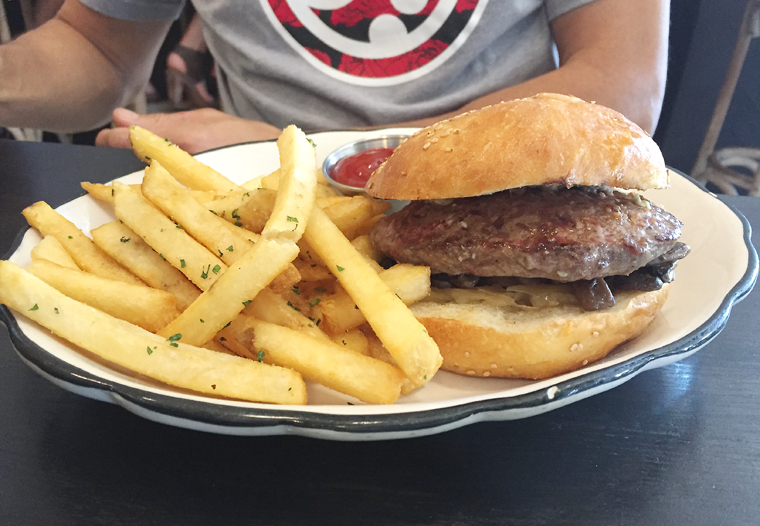 The juicy patty comes adorned with caramelized onions, mushrooms, and Point Reyes blue cheese. It’s everything you want in a burger. The accompanying fries are delightfully crisp with not a soft one among the bunch. This is also the burger that the Wassems give out for free when they host blood drives. Yes, give a pint, and get a free burger in return. How’s that for a deal? Next time, I’ll be sure to get there for the brunch menu — along with another bowl of matzo ball soup. 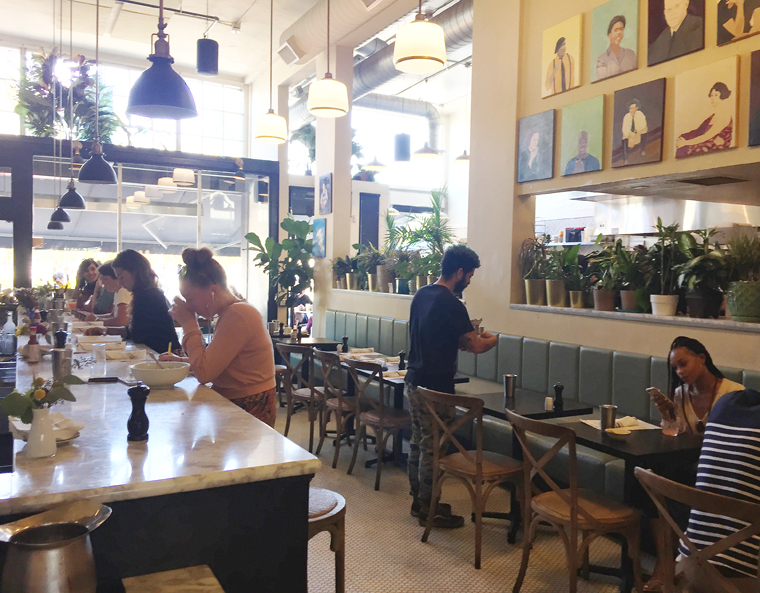 This is a consistently busy place, you need to go back and try the brunch menu, which really feels like its signature dishes. They should make it brunch all day. Awesome review! I went for brunch and only saw the matzo ball soup so I definitely have to go back and try some. Love the jewish inspired menu. Great pics too!